Higly skilled and compassionate caregivers and medical staffing solutions in our towns -- Northbrook, E-Town and surrounding towns on the North Shore, too. We love it here and love to help you. 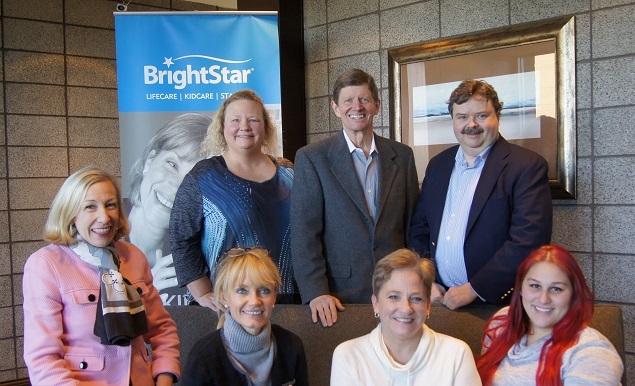 At BrightStar Care of Northbrook, owned by Jeff Emrich/Carl Kettler, our in-home care agency provides quality home care, caregivers, and medical staffing solutions to families and businesses along the lovely North Shore of Chicago. We offer compassionate care, peace of mind and exceptional service — any time, any place. Local owners Jeff Emrich and Carl Kettler (us again) provide the highest quality LifeCare, KidCare and healthcare Staffing solutions to families and businesses throughout the northern suburbs. Compassionate care and peace of mind — any time, any place--especially here in the neighborhood which is our home too. Our local BrightStar team is your home town team (go Northwestern! and available for you 24 hours a day, 7 days a week with an RN on call to provide the highest level of care and service. Please give us a call today at (847) 510-5750 and we'll be happy to answer your questions--personally. BrightStar Care of IL - Evanston is committed to delivering the highest quality care. We have voluntarily attained accreditation for our home care agency by the Joint Commission which is a nationally recognized quality standards organization with rigorous standards. The creation of BrightStar stems from the desire to create a great company with a great purpose: To provide families and their loved ones with the highest level of accessible home care, dignity, and personal attention they need and deserve. Proudly serving Lincolnwood, Chicago, Evanston, Skokie in IL.and points north. Let's talk about a personal, compassionate in-home answer for you. FOR A FREE IN HOME CONSULTATION Contact us today!